And, if you ask me, they taste pretty darn good, too. So I generally try to include them in my diet on a frequent basis. Casseroles, soups, tacos, salads, and even certain pasta dishes are great food items to drop some beans into. And I do mean that literally, not euphemistically. Lately I’ve been on a homemade hummus kick, but since I balk at buying any actual tahini (have you ever bought tahini? You have to buy like gallon at a time and it’s hella expensive!) I’ve been experimenting with recipes that don’t call for it, like this garlicky version with plenty of my dear wonderfood, beans! With two full cans of cannellini or Great Northern beans, this recipe makes a big batch, perfect for sneaking off into a closet with the bowl clutched to your bosom so no one else can eat it. I mean, for parties. PARTIES is what I meant to say. 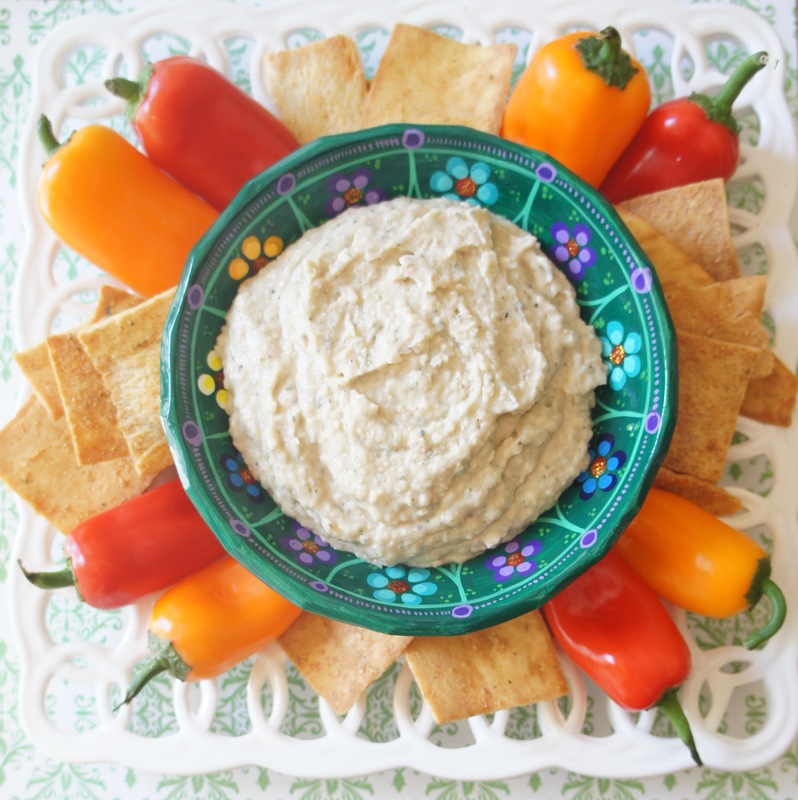 Seriously, though, this white bean hummus is my new favorite snack/appetizer/side. Even though I’ve scoffed in the past about how hummus and pita chips is everyone’s go-to, last-minute, classier-than-chips potluck contribution, the deliciousness of this version kicks it up into “bring this any time” territory. Mild white beans mixed with punchy garlic, lemon juice, cumin, pepper, and parsley creates the perfect edible yin and yang. Mild white beans mixed with punchy garlic, lemon juice, cumin, pepper, and parsley make for a uniquely delicious hummus! In a small saucepan, cook garlic in olive oil over medium heat until garlic begins to brown. Remove from heat. With a slotted spoon, scoop garlic into the bowl of a food processor. To the food processor bowl, add drained beans, lemon juice, cumin, parsley, salt, pepper, and cayenne. Process until smooth. Carefully pour in reserved olive oil while the machine is running and process until well incorporated. Serve immediately or store refrigerated in an airtight container. Enjoy with pita chips or fresh veggies! But there have also been good times. Like the reading together, restoring the dollhouse my grandpa built for me when I was 7 for and giving it to my daughter, and playing with this bizarre toy that defied all logic to become the hit of our Christmas. Today, being the last day of all-kids-all-the-time for a little while, I decided to make it a day of Fun Foods. (Cause food is my love language.) 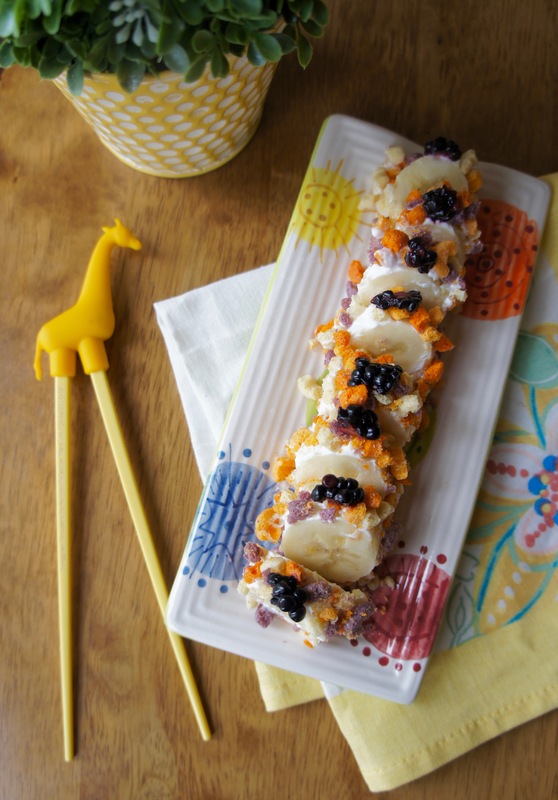 In the morning, I made my kids breakfast in bed, then for lunch we had Hawaiian pizza, and at snack time, it was time to roll out this goofy thing I’d seen on Pinterest months ago…Banana “Sushi”! 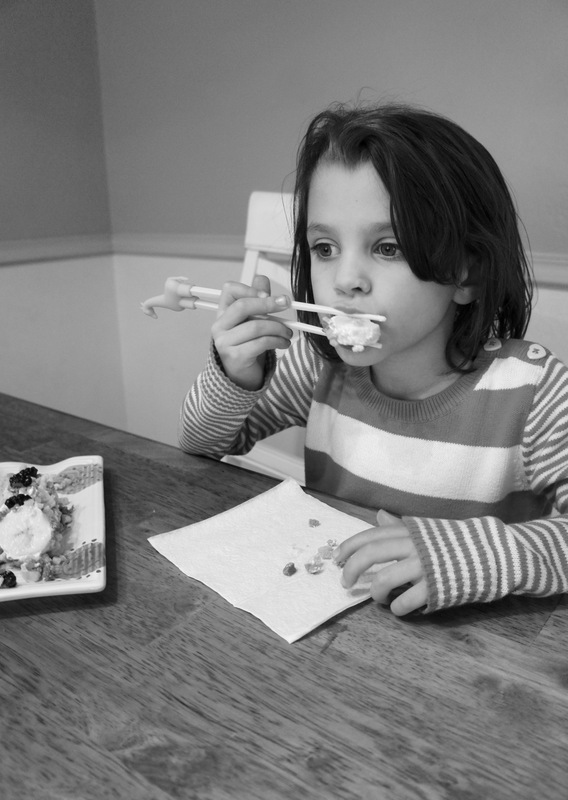 My middle child actually really likes real sushi, but to my other two kids, I’m pretty sure sushi is an alien creation that’s about as edible as elephant hide. 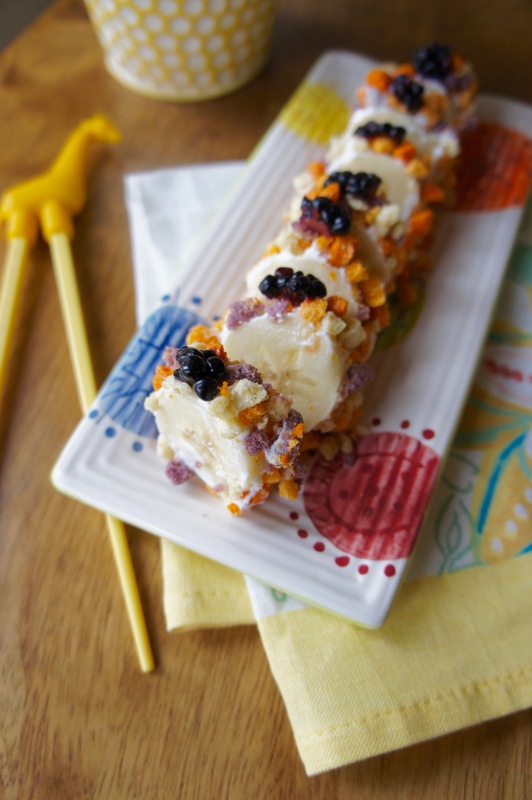 This reimagined version of sushi, however, even my 5-year-old was stoked to try. It’s essentially just a cereal, yogurt, and fruit parfait in a different package that’s a lot more fun to eat than smooshed together in a cup. And a whole lot cuter, too! 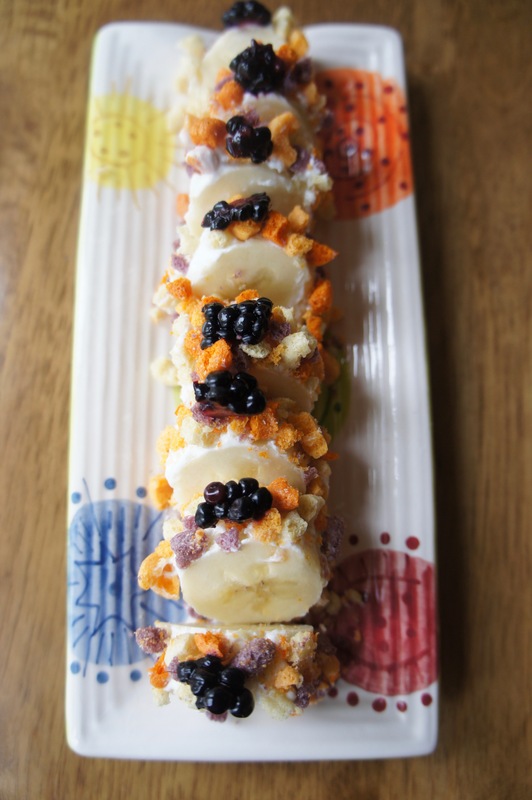 Banana Sushi could make a unique breakfast, a fun finger food with lunch, or just a made-with-love healthy snack–perfect for a chilly, cloudy last day of Christmas break. (Cause Lord knows this kind of thing is NOT getting packed in my kids’ school lunches.) Give it a try and see if your little ones enjoy it as much as mine did! Or try it yourself–you might realize how fun it is to eat bananas with chopsticks. My 5-year-old taking a nibble. Giraffe chopsticks from World Market. 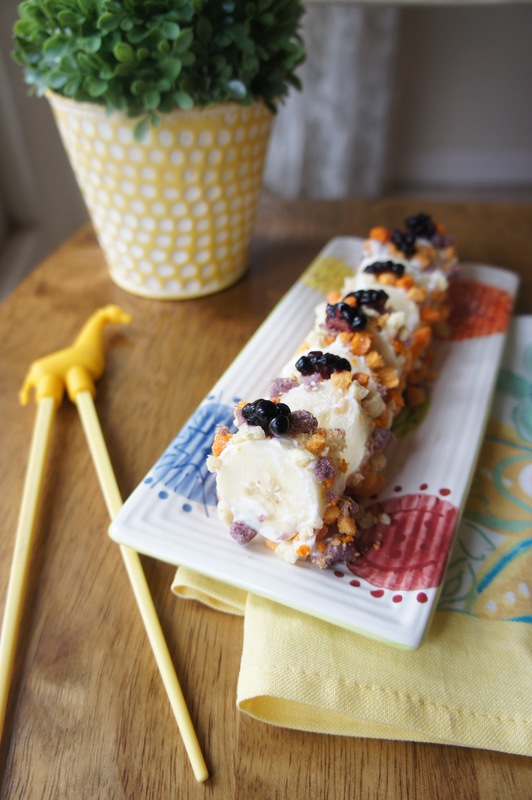 A fun, healthy way to eat "sushi" for breakfast or a special snack! Coat the surface of a peeled banana with yogurt. Place crushed cereal in a shallow bowl and dredge the yogurt-covered banana through it until covered. Slice and top with blackberry pieces. From an idea seen on Raising Whasians.